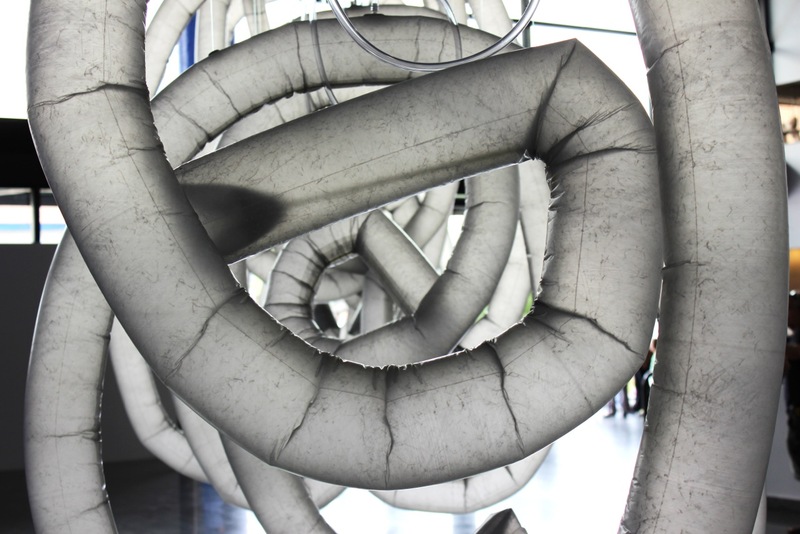 Organic Arches II is a site-specific installation consisting of a progression of inflatable arches in different sizes that undergo an organic metamorphosis several times a day. Suspended from the ceiling and barely touching the floor, these hand formed arches are levitating and inhabiting the space with their weightlessness. Their diaphanous skin, a specifically designed high tensile fabric with a built-in memory, absorbs the daylight and offers a view into their inner workings. As the air starts to exit the rigid fabric tubes, the architecture is set in motion creating a new expectation of form. In deliberately subtle movements, the arches curve inward and slowly spiral up into individual organic things suggesting the coming alive of matter, the awakening of a living system. In their transitional state, between architectural form and live organism, the arches surprise with an interplay of almost human gesture before they merge into abstract sign language as their own form of expression. In this context, the random movements of each visitor parallel the actions of this computer-controlled organism to create a new paradigm of hybrid symbiosis. As a metaphor and magnification of the invisible microscopic life, Organic Arches II takes its audience on an imaginary and visceral journey in and out of the body and into the machine. This ever-changing choreography of programmed and arbitrary activity establishes a distinctive time space where the mental and the perceived images overlap activating a new experience and memory within a kinetic live environment. Chico MacMurtrie is internationally recognized for his large-scale, robotic installations and interactive public sculpture. Chico MacMurtrie is the Artistic Director of Amorphic Robot Works (ARW), a collective of artists, technicians, and engineers based in Brooklyn, NY. MacMurtrie’s robotic sculptures have been exhibited in major museums and institutions worldwide, including Museo de la Reina Sofia, Madrid; MUAC, Mexico City; 9th Shanghai Biennial; SESC SP, Sao Paulo; Cité des Sciences, Paris; and NAMOC, Beijing.